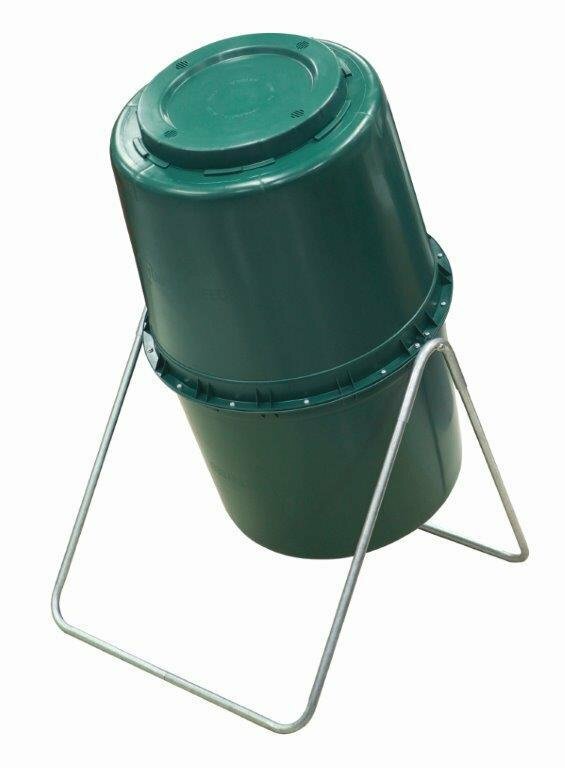 Compost tumbler made from 100% UV protected green recycled material.Dimensions: 33 ½” x 33” x 45”h (fully assembled) with a capacity of 58 gallons/7.75 cubic feet. Easy to assemble (2 halves, frame), spins vertically to maximize compost production and features an internal stainless steel central breaker bar that mixes and aerates to speed decomposition.Sturdy galvanized steel frame/legs to stand on any surface. Weight: 30 lbs empty, and comes with a 1 year limited warranty against manufacturer defects. *This item, the GeoBin and the worm bin are the only two where the price includes shipping directly to your home, everything else needs to be picked up on April 27th.